Stoke City vs. Chelsea : 12 January 2012. I awoke on Saturday morning with a mixture of feelings. Outside, the weather was dark and depressing. I had negative thoughts about the entire day to be quite truthful. After the Swansea defeat on Wednesday, I knew that a redoubtable Stoke team would be looking to heap further misery on the club. And then there were all of the churned-up feelings about the politics of it all; the board, the manager and the supporters were seemingly at odds with each other and emotions were tugging my heartstrings in a hundred different directions. And yet, I knew that there was nowhere that I would rather be on this particular winter’s day. The city of Stoke-on-Trent was my home for the best part of three years, from September 1984 to July 1987. I studied human geography at North Staffs Polytechnic, which was based in the city. For many personal reasons, I always enjoy returning. So, I decided to make the best of the day out in Staffordshire, but I did wonder what my state of mind might be in when I would eventually return. There was no doubt about it; this could be a bad day. A very bad day. I left home at 10am, with a 150 mile trip to the middle of England ahead of me. I soon texted my partner in crime Alan, who was travelling up on one of the official Chelsea coaches with Gal. I tuned in to the Danny Baker show on five live – if there’s a better programme on the airwaves, I am yet to find it. Baker used to host the original “606” programme when it was first broadcast in around 1991. At the time, it was natural for that programme to follow on from the launch of a thousand and one fanzines just a few years earlier; it gave normal fans the platform to air grievances, but to share anecdotes about the quirkiness of being a football supporter. I remember back in those days, Baker would hardly mention any of the day’s games, nor would supporters care. Talk instead was of comedic moments from fans’ pursuit of their teams, sightings of footballers in unusual places, bizarre pre-game rituals, favourite kits, banter and humour. If anything, Baker actively discouraged the general public from phoning and taking about specific games because – for the 99.9% of listeners who would not have seen the game – it would have been a waste of time. How I wish that ruling was prevalent today; the current “606” show with Mark Chapman and Robbie Savage dwells too much on specific incidents in specific games. I drove through Bristol, with no signs of the overcast weather lifting. At 11am, I eventually made it up onto the M5; it had been a slow start to the journey. I randomly selected a CD; a collection of songs by Tears For Fears, a band from Bath – my birthplace – that I used to admire back in the days of my time in Stoke. In those first few weeks of finding new friends at college, Tears for Fears acted as a cornerstone for me. The other two cornerstones were sport-related. …maybe we should have a group primal therapy session in the away section of the Brittania Stadium later in the day. Just south of Birmingham, a few fields were dusted with snow. I soon drove past West Brom’s ground; the final straw in the league careers of Andre Villas-Boas and Roberto di Matteo. At the intersection of the M5 with the M6, at last a few splashes of blue above the clouds. As I turned into the A500 at 12.45pm, I noticed a group of policemen in a lay-by, on motorbikes, in cars, on the look-out for Chelsea coaches and cars. With the Britannia Stadium on a high ridge of land to my right, I drove on up to the city centre in Hanley. And here’s the inevitable history lesson. During the industrial revolution, the area now known as The Potteries consisted of several independent towns; Stoke, Fenton, Longton, Hanley, Newcastle-under-Lyme, Burslem, Tunstall and Kidsgrove. Pottery was the dominant industry, although the area was endowed with a local coalfield which ably provided the fuel to fire thousands of bottle kilns. First canals and then railways ferried china clay in and pottery out, to markets throughout the UK, Europe and further afield. The names Wedgewood, Minton and Spode became world famous and put the area on the map. It was a hive of frantic activity, a real industrial hotspot. In 1925, five of the towns – Stoke, Hanley, Burslem, Fenton and Longton – came together to form the city of Stoke-on-Trent, although the slightly aloof town of Newcastle remained separate. My first few weeks in Stoke were spent trying to decipher the local geography and the local accent alike. The biggest anomaly of all was that the de facto city centre, housing the large department stores, library, theatres and bus station, was in the centrally-located town of Hanley. I lived in Stoke, the southern-most of the five towns. Stoke had the train station, the polytechnic and Stoke City Football Club. The town centre of Stoke was only marginally bigger and busier than my local town of Frome. The most northerly town of Burslem housed the city’s lesser football team, Port Vale. As Chelsea Football Club now reside in the upper echelons of the football stratosphere these days, I am sure that millions of our global fan base has never even heard of Port Vale. If they have, I’m sure that many are unaware that the club is located in Stoke-on-Trent, even less that it is in Burslem. On my previous visits to the city with Chelsea, I have tended to re-visit my more familiar haunts to the south in Stoke and ‘Castle. This time, I decided to head into Hanley. By 1pm, I was parked up and was soon outside in the biting wind, stumbling around the city centre, attempting to recognise landmarks from a quarter of a century ago. In The Tontine, I ordered a pint of lager (“lahh-geh”) and was surprised how cheap it was. The long narrow pub hadn’t changed much in the 25 years since my last visit. I noted a few Stokies talking to a couple of Norwegian Stoke fans who were in town for the game. The world gets smaller and smaller, doesn’t it? In my time in the city, the locals were very insular and local to their town. I was reminded of a story which one of our lecturers told in an attempt to explain the colloquial nature of the Stokies’ mindset. One of his aunts was touring America and she found herself on a local radio phone in. The radio presenter asked where the woman was from, since the accent completely threw him. Not only did the woman presume that the presenter had realised she was from England, she didn’t even bother with the city name of Stoke-on-Trent, which the poor bloke might – just might – have heard of. Around ten friends and I travelled down to Wembley on an official Stoke City coach for the final World Cup qualifier for the 1986 Finals in Mexico. England had already qualified, but there was a chance that England’s opponents Northern Ireland could qualify too if they could muster a draw at Wembley. However, I had another reason. It would mark Kerry Dixon’s home debut for England. I had to be there. Kerry had broken in to the England squad on the summer tour of Canada and Mexico, but had yet to play at Wembley. I don’t remember the trip down to London at all, save for the fact that it was a strange mix; half Stokies, half students from the poly, most of which I knew. Two friends – Nigel and Trevor – were from “Norn Iron” and were gung-ho about their team’s chances. We all had standing tickets in the “home” end (the tunnel end) at the old Wembley. What a thrill to see Kerry Dixon, in a plain white shirt, play at Wembley on that misty night. Chelsea used to go en masse to England home games in those days and as the game developed, there were quite a few chants of “Chelsea – clap, clap, clap – Chelsea – clap, clap, clap – Chelsea – clap, clap, clap” in that home end. Of course, I joined in. It felt like Chelsea had taken over the entire end. It was a magical feeling. 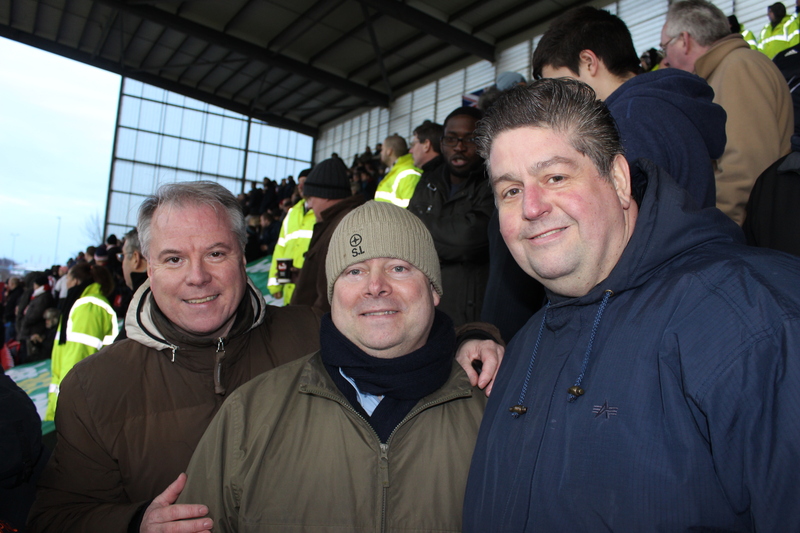 The game ended 0-0 amidst jeers of “It’s a fix, it’s a fix, it’s a fix.” At least Trevor and Nige were happy. It was 1.45pm and I needed to drive the two miles south to the stadium. I decided to drive past my old faculty building on Leek Road. However, the traffic was horrendous. I slowly made my way down the hill from Hanley and I soon crossed over Cauldon Canal, with one of the last remaining bottle-shaped kilns alongside it. Ahead of me was a large open space of land which was formerly the site of a large pottery. Beyond, red brick terraced houses, then industrial units, then the open wasteland up on the hill. Pretty, it certainly wasn’t. I was taken aback by the amount of new buildings which had sprung up on the old football and hockey pitches at the polytechnic, which was renamed Staffordshire University a while back; we had a “Sports & Recreation Studies” faculty – or shortened to “Sport & Rec” or, mockingly, “Fruit & Veg” – and we had a healthy rivalry with Loughborough University. A bit like Ohio and Michigan, Auburn and Alabama, UCLA and USC (he said sarcastically.) A new sports centre for the University had been built and was named after the city’s most famous son Sir Stanley Matthews, a native of Hanley, who played for Stoke in two spells from 1931 to 1965. He was Europe’s first player of the year and played until the age of 51. A real legend, believe me. As the traffic slowed just outside the old entrance to the Leek Road campus, I spotted hundreds of Chelsea fans, newly arrived at the nearby train station, awaiting buses to take them to the game. I spotted a few faces – Aggie, Callum, Tim – and it was a weird sensation. A personal space, to me, had become a shared space for many Chelsea fans. It couldn’t have been stranger if the same people had been spotted outside my village shop. By 2.40pm, I was parked up on the grass verge of a road to the south of the Britannia. The cold wind was unrelenting as I quickly walked towards the bright features of the stadium, over another canal, the past never far away. There’s surely not a more inhospitable location for a ground in all of England. Like a fortress, The Britannia stands indignantly on that ridge of high land, its inhabitants ready to wail at visitors. “We are Stoke, we are Stoke, we are Stoke” they yell. On its day, it’s a red hot – and white – atmosphere. The Chelsea section, three thousand strong, took up three-quarters of the south stand. The Brittannia Stadium is a strange one architecturally; two stand-alone structures, but two stands joined. I stood alongside Al and Gal in the second row of the upper tier, just to the right of the goal. I scanned the team and noted the changes since Wednesday. Great to see Petr back, that’s for sure. I looked across to the main stand, in two-tiers, unlike the rest of the stadium, and set well back from the pitch. There was Tony Pulis, in trademark baseball cap, alongside Rafa Benitez, already cajoling the Chelsea players with his strange selection of hand jives. Most importantly of all, I checked to see his tie colour. We certainly weathered the Stoke storm in the first-half. A Kenwyne Jones effort after just 7 minutes whizzed wide of the far post when we were all expecting a goal. A succession of Stoke corners caused us to be fearful, but everyone was repelled. Branoslav Ivanovic was showing great positional sense with no signs of suffering from his performance on Wednesday. A shot from Lamps on 24 minutes raised our spirits. Frank began to impose himself from deep and was the instigator of a few attacks. Hazzard and Mata buzzed around. Another shot from Frank, but Ramires couldn’t follow up. What a brilliant own goal from John Walters, as ordered right before half-time, under pressure from Demba Ba. It was cold, but not as cold as our first-ever visit to the stadium in 2003 for our FA Cup game. Alan and I agreed that, in comparison, the weather was positively balmy. That Sunday afternoon ten years ago was the coldest I have ever been watching Chelsea. A rasping shot was gloriously tipped over by Petr Cech on 53 minutes, but Stoke thought they had been awarded a penalty just after. Thankfully, an offside was given instead. We breathed a sigh of relief. We got into our stride and continued to exploit the spaces as Stoke attempted to get back in the game. From a corner, that man Walters headed blindly into his goal with Frank right behind him. We exploded with joy again, but nothing compared to look of biss on Frank’s face as he beamed a massive smile as he spun around and shared his joy with the away fans. It was a lovely moment. Next, a chop on Mata and a penalty. “Give it to Walters” chimed Gal. Frank drilled it high past Begovic and we roared again. 194 goals for Frank Lampard. Fantastic stuff. The goal was filmed on hundreds of smart phones. Just after, with the away end booming, Frank almost reached 195 but couldn’t quite reach the rebound of a shot. After a little provocation, the Stoke fans finally made some noise, showing commendable qualities in getting behind their team when losing. The game was wrapped up when Juan Mata fed in the excellent Hazard, who unleashed a swerving bullet into the top corner of Begovic’ net. I was right behind the course of the ball and detected the slightest of deflections. 4-0? Beyond my wildest dreams. It still didn’t save Benitez, though. The loudest chant of the day was his. However, at least I didn’t detect any booing of Torres when he replaced Ba. The game was due another comedic twist when substitute John Terry felled Walters inside the box. The troubled Walters blasted over and we howled with laughter. I hurriedly rushed down to my waiting car amidst hundreds of quiet Stokies. The “feast and famine” football was continuing and Chelsea Football Club was playing games with my addled brain. I pondered the notion of only attending every other game; satisfaction guaranteed surely? I wondered about the welcome that Walters might get from his wife as he returned home later that evening. Within three minutes – I love Stoke, especially leaving it – I was back on the M6. Tears For Fears know fcuk all. This entry was posted in Season 2012-2013. and tagged 1985-1986, 2012-2013, Danny Baker, England, Frank Lampard, Stoke-On-Trent, Wembley by Chris Axon. Bookmark the permalink.